I was flipping through a newspaper last weekend when an article caught my attention. 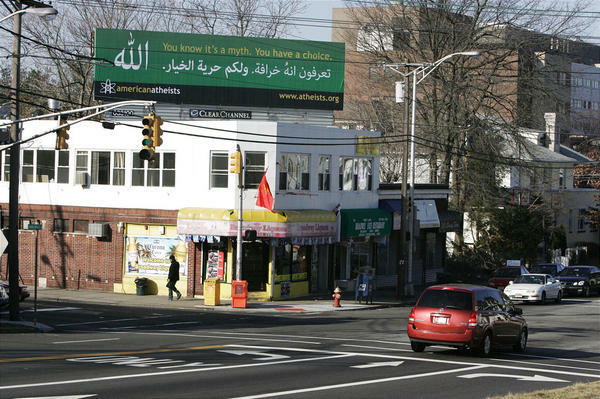 It was titled “Muslims take Atheist Group’s Billboard in Stride, but Christians Criticize Move”. The blurb covered a billboard posted earlier this month in Patterson, New Jersey that declared religion a myth. It says both in English and Arabic, “You know it’s a myth. You have a choice”. Ironically enough the sign was posted across the street from a neighboring mosque with the goal of asking atheists “to come out of the closet”. Let’s say I found it amusing. Some people, like the salon owner directly below the sign, were disgusted with the signage. They’d have preferred the person behind it to have kept the comment to themselves. Others admired the use of free speech. Then there were the few stragglers who could probably careless as they walked past it. Now while there could be a million things to read between the lines , one thing stuck out to me towards the end. The leader of the Muslim mosque, Mohammad Qatanani; and the president of the American Atheists, David Silverman were apparently discussing things of a similar manner in regards to the sign. Raw matter…? Is that all? Well we may be made of raw matter, secured into the form of a human with arms and legs and have the ability to think, but that’s not all. There have been numerous theories supposing where we may have originated from, including evolution and the famous big bang theory. There are scientists perplexed by the mysteries of much of creation. Where do we come from? What’s my purpose? And where do we go when its all over? They are big questions and how we answer them shows up in how we live our life. He’d probably say something along the lines of evolution, and that we evolved from a series of various creatures over a period of time as a means of survival. Perhaps it is to bring atheists “out of the closet” or to unite them? I’m guessing Silverman is a great speaker and organizer as he is the president of the American Atheists, though I would like to see him use his skills towards something else rather than renouncing God. Where do you go when it’s all over? This has to be the grabber of all questions. As Christians we believe you either go to heaven or hell based on the effects of what we call sin in the human race and faith in Jesus Christ. You see God is a holy God and cannot be around anything evil. He made man pure, but man fell (did wrong) and sin entered the world. Because sin is so horrible, God could no longer be with man though that was what we were created for. We were made to be with God. Ever hear the term “only human“? Well we are and thus imperfect. We make mistakes, just like the first man did. But God couldn’t leave his wonderful creation to decay and fall only into hell, forever separated from Him. That was never His plan. So since we could never fill the gap or be completely perfect, He had to do it Himself. He did this through His Son, Jesus Christ. You see sin has a price and must be paid for. The only way we could pay for it was eternity in hell. However through Christ, God paid that price. Through faith in Jesus, our sin is covered and we can once again “hang out” with God. Now if you take all that away—or any religions beliefs for that matter—and what do you have? You may have the source of where you come from, but purpose is lacking. Life has no purpose in itself. We would be forced to think along the lines of “survival of the fittest“, but then social order and morals would then be proven pointless. If life was only survival of the fittest why let protect children from pedophiles and women from rapists? Why have a government to keep order and establish social classes? Without purpose life is pointless. Then again there is the question of death. It’s inevitable for everybody. We all have a real, physical death. Most of you have dealt with the grief that goes along with losing a loved one. I have. My question is, if you spend all your life fighting for the survival of the fittest only to die in the end, what’s the point? Yes, you may have made things better for those who come after you. I think we all can agree that some modern convinces likes cars make life much easier than in years past. But eventually, after you’re gone, you’re forgotten. Perhaps not by those closest to you, but in the later generations your name will only be a memory soon to fade to nothing. Think about it. Of all the historical figures we know of, we hear more about those who made very significant impacts politically, socially, ethically, etc. But what about the mother who sends her kids to school everyday and gives them a hot meal? Or the dad who does what he can to make ends meet? We don’t hear much about them do we? When life ends what does any of it benefit us anyway? We can’t take any of it with us. The pharaohs of Egypt tried that. What about the soul? What about your soul? 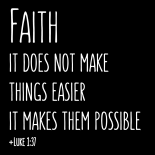 I think it takes more faith to believe life is just life, than to believe something as simple as the Gospel of Jesus Christ. There is more to life than the mere day to day we see here. There is more than survival of the fittest. There is more than just the grave and our own inevitable death. There is life! Want to know more about this Gospel thing? Visit www.everystudent.com or email The Faithbook at thefaithbook@yahoo.com. If life has no value at say 64 years, will stretching it into infinity really help? Life does have value, actually. It doesn’t matter if it’s a child in the womb or that of an 84 year old man. Every person has value, and i’m not speaking monetary either. We are all precious people and each one matters even though we may not feel like it at the time. Picture a child (I’m not sure if you have any of your own). But I have had the wonderful opportunity to watch my two nieces and three nephews grow from their infant days to their elementary years thus far, and I wouldn’t trade it for the world! It would be sad to see life end and all this world be naught–particularly their lives. I don’t have one. But I love people, both specifically and in general, and want to see good things happen for them even after I die. You might think that, but you’d be wrong. Particularly looking at all the supernatural claims in that gospel. I’ll admit the Gospel is pretty far out there, but then again it’s not much farther out there than some of my favorite sci-fi movies like Star Wars (not that i’m comparing the two-that would be strange). Humanity in general has a fascination for what’s beyond it and always has. It’s interesting. But then again back to reality, I’ve seen some pretty crazy stuff happen that has been both described in the Gospel and various other scientific or non-religious materials. Some of which has happened to very close friends, so the Gospel doesn’t seem so quite far fetched to me. As far as loving people goes, I can tell you’re very sincere. I don’t doubt that you care for people. We do make mistakes and hurt them whether we want to or not though. As I said, we are human and we’re far from perfect. However, imperfection doesn’t strip us of the ability to love, or to want to be loved. We all have this desire: to love and to be loved. Some people are very good at it and they’re not even Christians! They just have that one of a kind gift. It’s also the one reason we exist–because we are loved. As for the soul, we’ll save that for another post I hope you’ll read. Thank you for reading this one and voicing your opinion! Okay. If you could provide evidence for such things, I imagine you’d get a lot more converts from the atheists. I’ll do my best NotAScientist.Thanks again for reading. Hi. Mr. Silverman is a busy man, so I doubt he’ll have time to answer you. But I can, if you’d like. 1. Yes, evolution is the accepted theory on how humans and animals came to be how they are today. 2. You choose your own purpose. Life is only as pointless as you make it, but being eventually forgotten should be an incentive to be especially unforgettable. 3. Where do we go when we die? I don’t know. No one really does. But as atheists don’t generally believe in souls, we’re not really concerned with that. I think you’re a little confused on the whole Survival of the Fittest thing. That’s how things evolved in nature, not how atheists think people should live. Atheists are usually humanists. I’m afraid I disagree with you. Atheists don’t believe in the supernatural because they require testable proof. That’s not faith, it’s the opposite. And have you really examined your what the Gospel of Jesus Christ wants you to believe? A Jewish zombie from space that was born of a virgin and is his own father can save you from him punishing you if you metaphorically eat his flesh and drink his blood (and telepathically accept him as your master), so that he can protect you from a force of evil that is present in this world because a woman made from a rib of a man made from dust was convinced by a talking snake to eat from a magic tree. But it takes more faith to not believe that? Well thanks for answering Alex! I realize Mr. Silverman is a busy man–being president and all. 1.Evolution–I think we’ve both made our points there. 2.Purpose–Purpose is what you make it. We are given a choice. We can make it as wonderful as we can, or make it as much like hell as we can. And I’ll agree with you about the unforgettable part. 3.When we die–I’ll admit there’s been lots of theories and religions that all suppose an answer, for me, Christianity makes sense even if it is a little strange to people. On Survival of the Fittest, I have done my homework. I quite enjoy reading scientific studies and documentaries. Darwin used the phrase when referring to animistic survival in the form of adapting oneself to their environment. According to evolution theories there are two types: macro and micro evolution. Macro, as it suggests, refers to a significant change in a species such as a fish developing lungs for land. Micro which is commonly seen are sudle changes like thicker feathers or the lengths of a birds beak in order to adapt to it environment. It can also be seen in our own ability to tan or burn in the summer. Micro evolution has been proven while macro still lacks significant evidence. On the other hand I don’t believe this is how atheists operate. I’ve seen many who run humanitarian organizations, helping the needy and even in dealing political,social issues. Believe me I can never view atheists as monsters or out ravaging humanity. Being atheist doesn’t make you less human. Being atheist is the act of denying God’s exsistance whether it’s for lack of proof or other reasons. I am examing both sides of the bridge here, however far extreme it may be. That’s quite an interesting brief summary you gave of the Gospel there. Yes, it is out there and while I might be tempted to debate, I’l admit its isn’t always easy to believe. It’s hard to trust someone, much less something outside of yourself with say…your own life. Even more so someone you can’t physically see for the moment. It’s something I’ve had to walk through a majority of my life and will continue to do so. For me, honestly, it is easier for me to believe this than to simply believe I’m alive for however long only for it to end and that be it. I’m not scared of death. I want something more I know is beyond it and no other ‘religion’ in every sense of the word has been able to give that to me. I’ll challenge you, Alex, if you don’t mind. Go find a Bible–any Bible–and read it cover to cover (even if you already have before). View it objectively if it helps, and get back to me about my Jewish zombie. The Faithbook is always open. Thank you for reading. Sorry, but this is incorrect. According to creationists, there are two types of evolution. According to science, there is just one, and there is significant evidence for it. I’m not Alex, but I have done this. Multiple times. It’s no more convincing now than it was when I read it and it inspired me to become an atheist. I’m glad you have the read the Bible, not once but several. The Bible does have two reactions to it: either you believe it or you don’t. The book even says that itself. I know you have chosen to be an atheist, and while we may not see eye to eye, I’m am still very grateful for you thoughts and comments. I do hope you continue reading. I’ve also read the bible, and am in the process of re-reading it. Viewing it objectively, without any bias for or against religion, lead me to find it immoral and unbelievable. It also lead me to becoming an atheist. I also agree with NotAScientist on micro/macro evolution. Both micro AND macro evolution has been observed and recorded, but in scientific terms they are the same. I’m glad you have read the Bible and re-reading it as well. Viewing it objectively is a good as well, but my question I would like to pose is what kind of bias/view point do you carry as you read it? I mean this sincerely of course as we all bring a quantity of bias to any material we may read or video we may watch, Atheist, Christian or not. Suppose you were reading a book on warfare techniques for instance. Depending on your views of such an activity, would affect your overall view of the material. Those could be whether you favored war or not, your ideals about the use of weapons and the many different kinds, including our own past experiences, etc. Even at viewing this material objectively (or black and white facts) we are still tempted to lay our own opinions with what we have read. This goes for everybody. Just like reading the weapons book, the Bible is no different. If we bring our pre-concieved ideas—no matter how far we push them back as we read—it’s likely they will still distort our objective view, thus rendering it subjective once again. “The Wizard of Oz” was a story written also to a particular people (American’s) and a particular place and time. During the time it was written America was in deliberation about removing the ‘gold standard’ as a monetary method and changing to something different. It’s writer wrote the book in an attempt to refute the matter in favor of the gold standard. At that particular time the book was read with this meaning in mind. Now it is more of a story children read in school as a prime example of American literature. You must do your homework if you really want to know what the author was getting at, but in general the story is interpreted as story alone and not as the political propaganda it was originally intended. I’ll take another American example: The popular American poster of Uncle Sam and the Phrase “I want you for the US Army”. The poster oozes with political propaganda as well, once again to a particular people at a particular time, though it is still used today. But Uncle Sam was not a made up character solely for these posters. He was a very real man who delivered supplies to US soldiers. Because of much of the help he provided, he was given the nickname “Uncle Sam”. Some soldiers, seeing US military supplies stamped with the US for America, miss took it to mean Uncle Sam, and thus the supplies were from him as well. Keeping this particular story in mind, the poster brings about a strong patriotic sense. It’s meant to stir patriotic feeling in those who see it and bring to remembrance the story of this Uncle Sam, thus encouraging Americans to do as he did and willingly serve their country. To some this meaning is still the same but to others it is merely a graphic on display and an advertisement for the army, yet there is so much more meaning to it than that. Now keep in mind I say this keeping in mind myself that you are leaving out your ideas about religions in general—and that is good. What I am questioning if you bring any bias of atheism as you read it, or perhaps other experiences. Perhaps the first time you read it, you were disgusted and thus expect very little to be different this time as well. That is to be expected and I make no judgements there. I myself must be careful not to read it from my own personal experience, etc. If we are ever going to read any material as it was intended, we must take in consideration who it was written to, their place or where they lived (including culture), and time in which it was written. I would recommend reading a section from J. Daniel Hays and J. Scott Duvall’s book entitled “Grasping God’s Word: A Hands-On Approach to Reading, Interpreting, and Applying the Bible” and look for the section at the very beginning where they speak about the ‘journey of interpretation’ or ‘the river’. This method is applicable to any written material and highly rated among religious and non-religious groups. Hays and Duvall further break down what is meant by pre-assumptions or pre-concieved notions, bias, culture differences, etc. Perhaps you can use it’s methods along with your current session of Bible reading. Keeping leaving out any religious bias as you have been, but also leave out any atheist bias you may have as well and let me know. I look forward to hearing of your reading, however the result. Many thousands of years ago the Egyptians buried their royalty with their gold and servants so they would have them in the afterlife. When we open the tombs in the early 1900’s, the gold was still there. The bodies were still there. There is nothing when you die. It’s like when you get knocked out before surgery. It’s a total loss of consciousness. When you wake up from the surgery, you’re in a different room then when you went to sleep and things in your body have been changed by other humans. When you die, you just don’t come back to consciousness to see where you got moved and what other humans did to you. Is is really that scary to know that things are going to happen to you and you can’t do anything about it? Is that why you believe that a supernatural entity impregnated his mom so he could be “reborn” and then die and come back as a zombie to save the world because a talking snake convinced a woman made from a mans rib to eat a magic apple that the entity put there to begin with? Sorry. I’m completely at peace knowing that when I die I’ll never have to worry or be sad or hurt over anything again instead of trying to believe in something as ridiculous as the christian resurrection myth. A friend of mine who recently moved got into a major accident and was in ICU, but mentally it was hard to comprehend the extent of the damage done to the car, or my friend until we all saw a picture of the wreckage. When we saw the totaled car we could then get a picture of the accident. Even more so we could get a better picture when we were told what kind of condition our friend was in. Doctors were saying he should have died, and while we could vaguely picture it, it only became more clear when we actually saw or heard something. We’re physical people, and we require something physical for us to believe—or at least it makes it easier for us. That’s why Christianity requires “faith”. Faith is believing without seeing—though it is not blind belief. Now while I know a car accident isn’t the best example of belief, perhaps it gives you a better idea. As for your decision, it is your decision. We do have the choice to believe and not to believe, choices we have both made. Still I thank you for taking the time to read and post your opinion. Thank you. This entry was posted on Mar 21, 2012 by The FaithBook in When He calls and tagged Atheist, Atheist Group, Believe, big bang theory, Billboard, Choice, Christians, Dear Mr. Atheist, Eternity, Evolution, Faith, Heaven of Hell, Life, Muslim, muslim mosque, philosophy, Politics, Purpose, Questions, religion, Sign, The Gospel of Jesus Christ, The One, The Soul, What's my purpose?, Where do we come from?, Where do you go when it's all over?.